The biopsychosocial model of care is currently the model for which all healthcare professionals, including physical therapists, are expected to evaluate and treat patients with chronic pain. Physical therapists are now expected to recognize pain associated with psychosocial distress and to modify their treatment approach accordingly. The challenge with this is that there’s a gap that still exists between learning how to identify pain associated with these distresses and mastering the skills needed to apply the treatment. Every practitioner, and in my opinion it’s probably most important for those in the profession of physical therapy, need to embrace the psychosocial model and adapt their practice for its integration. Joining us today to discuss the biopsychosocial model of care is Dr. Steven George. He’s a professor and Vice-Chair of Clinical Research and Director of Musculoskeletal Research at the Duke Clinical Research Institute, part of Duke University. He’s a licensed physical therapist with a PhD in Rehab Science. He’s also an active member of APTA, The American Pain Society and the International Association for the Study of Pain. His primary interest is to, one, improve the accuracy for predicting who’s going to develop chronic pain and then two, identify non-pharmacologic treatment options that limit the development of chronic pain conditions. Dr. George, welcome to The Healing Pain Podcast. Thank you, Joe. Thanks for having me. I’m looking forward to the discussion. I think it’s a topic that is of course, timely knowing that we have a chronic pain epidemic as well as an opioid epidemic. Today, we’re going to talk about the integration of the biopsychosocial model into pain care and specifically into physical therapist’s practice. I think a great place to start would be having you explain in your words, in your opinion, what is the biopsychosocial model of care and why should a practitioner, especially a physical therapist, be interested in this topic? It’s meant to encourage people to understand some of the complexities that go along with certain conditions and certainly chronic pain is one of them. The term is an intentionally vague term. It’s meant to encourage people to understand some of the complexities that go along with certain conditions and certainly chronic pain is one of them. It helps me and others to think of them as having three major components: biological, psychological and then social. This was first brought to the attention in the low back pain where the models in the early 80s, people even then were getting frustrated with what was happening in low back pain and so we’re starting to look at alternate models. His work introduced the concept of the biopsychosocial model for application in low back pain. If you think of it, we’ve gone through an era of a lot of emphasis was on the biological and identifying pathology and that certainly had some limits with care, delivery and certainly a lot of people think that’s indirectly or directly led to where we are now where we get suboptimal outcomes with pain. I think certainly there’s enough evidence to suggest that, even brought some harm in certain cases. The next part of the model then is the psychological. That’s where I think there’s been a lot of promising research that helps us to understand a little bit better how chronic pain develops, how it’s maintained and maybe how we can help manage it. The third component is really where I think things are moving towards now the social component. That’s an area that we frankly don’t know quite as much. It’s a whole other realm because now you’re really talking about interaction on the healthcare system and society. When you think of incrementally moving care models along, I think we are solidly in this era of people wanting to implement psychological care principles. That I think is a great goal. With that in mind, knowing, the next step is really going to be how the society looks at pain and how does our healthcare system look at pain, how do we as physical therapists, as our profession, look at pain. That to me is the societal ring. Obviously, those don’t happen sequentially, there are things going on. When you talk about individual care episode, I think if you can think of what am I doing to consider the biological perspective, the psychological perspective and then at least being aware of some of the social issues, which right now really has a ton of information on pain. I imagine a lot of interest. That to me is a really effective way for PTs in particular to help make sure, at the very least, they have a better educated client or patient at the end of the care. It’s a great introduction. The topic of biopsychosocial model for care probably could fill a PhD in some ways. I think it is important, sometimes there is not one biopsychosocial model. You really have to break it down into operationally defining then what are the components you are looking at. It would be impossible to look at every biological, every psychological. Within one, it would be much too burdensome. It’s a model, it’s not the model. When people study it and when you apply it clinically, you have to decide what are you going to operationalize within that model, otherwise it would take three years to measure everything, and by then even the most patient patient would be probably on their way to something else. It could be overwhelming for the clinician as well as the patient, of course. I’m curious, just in your own trajectory, in your own professional career, you’ve treated patients for fifteen years and now you’re primarily in a research role. When did this biopsychosocial model really become interesting to you as a practitioner? To be fair, I treated full-time for about seven years. As I’d like to tell people, I’ve lost a lot of my street cred for being a practicing clinician. I just do that to be open and honest because I think clinicians have a really good nose for people who are actively practicing day-to-day. Certainly, the impressions that I got in the seven years were I think, on a conscious level, I was very interested in predicting who was going to do well and who wasn’t going to do well. At the time, there was a lot of interest. I practiced in the early to late 90s. There was a lot of interest in models on non-organic signs and symptoms and what did those all mean. A lot of people were really pushing those for clinical interpretation and pushing them in ways actually when you step back and look at how they were originally proposed, weren’t consistent with the way that they were meant to be interpreted clinically, by the way. My entire full-time clinical career was in Pittsburgh, Pennsylvania and worked in a clinical setting where they actually happen to have access to some data on the non-organic signs and symptoms. Really, we’re finding out that they weren’t the best for predicting whole treatment episodes, especially with acute back pain. I started talking to some people about what are some other models. At this time, it was still very early in the game. Chris Main and their group in United Kingdom I think had already seen what’s going to happen after the non-organic signs and symptoms and had developed a questionnaire called the Fear-Avoidance Belief Questionnaire. I remember seeing that in my clinical experience and just thinking in how tremendous face validity and it really was enlightening to me. When you look at some of those items, I’m assuming most people are familiar with that, but the items were basically, does physical activity harm me? Should I be doing things that hurt? I thought, as a therapist, that was something historically I had never been taught to ask. My history had always been what’s your mechanism injury, how you could surpass, what makes you feel better? That classic historical mechanism of almost like a detective, just the facts, tell me when it started, tell me where it hurts now, and tell me what makes it better. Then when I put myself in the position of the patient, I thought, “I’m coming to seek care from this young whippersnapper PT and he’s going to tell me I have to exercise to heal my back. My own belief system is I’m damaging my back by hurting it.” I know who’s going to win out in that. The patient’s beliefs are going to overpower anything that I can do, even if I was a reasonably well-trained physical therapist. That was one of those light bulb moments where I thought, “These are questions we really should be asking.” I still need to know about the mechanism of injury, but what I really like to know is if you think your back exercises are harmful to your back, we probably need to resolve that on some level. I think we were one of the earlier adopters of the Fear-Avoidance Belief Questionnaire in the US. That was really my bridge from clinical work to research work, because I started systematically studying the Fear-Avoidance Belief Questionnaire, learning about its strengths, also learning about its weaknesses. I became very well-versed in the Fear-Avoidance model and that became the center of my research program. I really think it was driven from that clinical question and it really just took off from there. I have not enough to be an advanced planner to say this was done in stages. I really just was along for the ride. The other thing that was really interesting to me clinically was early in my career we had a same-day surgery-type of situation where people would have anterior cruciate ligaments repaired by the same surgeon, the same anesthesia team and they would bring them to the PT gym I worked in the hospital. This was still in the day when you could be admitted for an ACL. We basically had to decide who was going to go home and who needed to be admitted. They would line up, sometimes five or six people and so many of the conditions were the same. We started developing these little prediction rules for who’s going to go home and who’s going to be admitted. Our predictions were terrible. It was really interesting and I think that was more of a subconscious hammering home how variable things were and how hard it was to reasonably predict an outcome as easy as who’s going home versus who’s going to be admitted. Those are some of the foundational things that pushed me in this direction. So many therapists rely on the Fear-Avoidance model. They still use it as a model in treating patients. There are other researches that I think has been really pivotal for the PT profession as well as many of the mental health professions. You mentioned beliefs. When we start talking about beliefs, we start to think about psychological factors and their influence on perception of pain. How do they have an influence on pain disability, and what can a practitioner start to do in their daily practice to start to think about and acknowledge these beliefs with patients? It really is something that we have talked about scaling up and how are we going to develop strong training programs to help physical therapists implement these skills. It’s really a question we’ve talked about a lot. I think on a couple of different levels, I think the very basic one is to acknowledge that these beliefs exist and that they are relevant. I don’t hear it that much and it’s either because people are more socially aware or that there is a little bit of shift in the zeitgeist of the profession where they understand this. There are some PTs that still feel that the physical and the psychological are completely separate. Being aware of the beliefs, understanding that they do influence behavior, they do influence outcomes, is really important. You have to believe that, you can’t just say that. That has to be integral to your practice. To be fair to physical therapists, those types of separatist beliefs, so to speak, exist in other professions too, such as primary care medicine. They have yet to really think about what are the psychosocial factors that are implicated in someone’s pain. We can even take this back to mind-body dualism if we really want to. Someone a long time ago separated those two and we’ve been dealing with that for a while. I agree with you, I think this is an issue with the medical profession. The stigma associated with what is happening in the mind versus what is happening in the body, and one being real and the other one not, is a completely other issue. After the practitioner has that look in the mirror and says, “How am I going to deal with this?” The important part is you do have to systematically measure these things. I don’t think you need to have a hundred questionnaires. I believe being consistent and measuring consistently, you learn so much about your practice, you learn so much about the patients. For me it was simply tracking the FABQ for a year and just learning when that was helpful and when it wasn’t. After the assessment piece, then I think it’s developing what are the treatment strategies that I feel comfortable with implementing? What are the ones that right now are supported by evidence? What are the ones that are feasible for my area of setting? This can be as simple as there are educational platforms. We’ve also talked to therapists about using the item responses on the questionnaire as a way of facilitating discussion. “I noticed you filled out this thing on this questionnaire that we asked you to fill out, that you think doing back exercises is harmful to your back. Why do you think that?” We need to talk a little bit about that. Psychologists are very good at facilitating disclosure through an interview. I think with PTs, that’s not something that we’re quite as good at. If you think about it, that whole intake battery is a form of exposure. What better way again to reinforce that I value your time, I’m looking at something you filled out ahead of time and I’m going to use it in this care episode. Those are some other strategies that we’ve done. Then finally, just getting to what type of pain coping skills are you going to incorporate? Is it progressive relaxation? Is it distraction? One of the ways I think PTs are optimally positioned is we can provide these in a way and structure them so the patient can get a really good idea about when are these strategies going to be helpful and when aren’t they going to be helpful? What strategies are optimal for me in increasing my walking time? What strategies are going to help me manage my pain so that I can do the lifting that I need to do at work? I think also getting the patients then to understand that not all pain they experience is truly damaging, that it actually can be used to build some resilience, just like we would train any other body system. That’s a nutshell look at it. I think when we train, we’ve been going through a period for some of the grants that we’ve been working on training PTs. These are things that we talk about and we try to be receptive to feedback. For me, it’s giving people the mindset that everything we’re doing is purely physiologically-based. Understanding there’s this behavioral belief linkage that if we manage that and think like a psychologist on that, we can actually get to a pretty good place with the patient and their outcomes and their behaviors. It’s interesting what you just said because when I think back to when I first started practicing, which was over twenty years ago, we’ve had a couple of decades of seeing changes in the profession. I think it’s awesome and it’s inspiring in a lot of ways. When I think back to those years, the patient education was driven very much from almost like a didactic way. When you talk about a pamphlet, it makes me think of something that’s along the lines of a psycho-educational intervention. 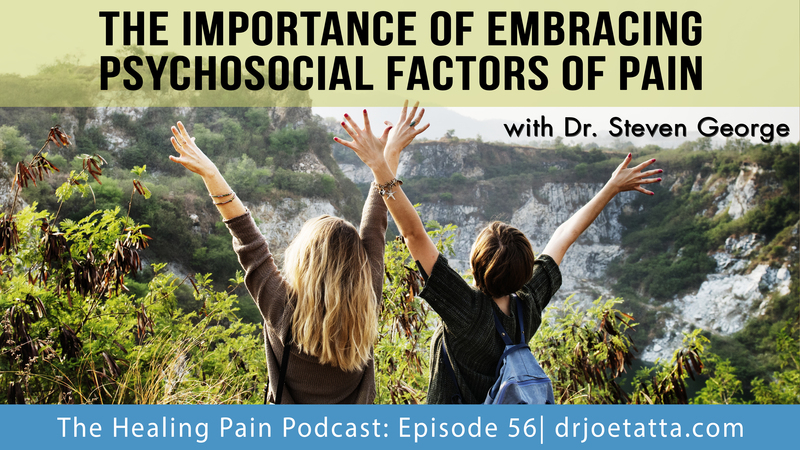 As we look at the literature and as we look at what’s going on in the profession, we’re talking about psychologically-informed physical therapy, how much of, let’s say, Cognitive Behavioral Therapy or CBT should we be embracing or accepting as a profession, as physical therapists or as someone who treats a patient with pain? Just to be in full disclosure, these lines haven’t been completely drawn yet. If you’re talking about credentialing, they’ll be drawn by someone else. I worked on this term with Chris Main who’s a psychologist in the United Kingdom and has done a ton of pain research. He’s very well-known. For people who don’t know that name, they want to look up some of his early seminal work. He and I were brought together to do a special issue for physical therapy in the American Physical Therapy Association’s journal. We had some of these same discussions. We decided that to avoid some of the turf-related concerns about who should be delivering CBT, that if you really think of it almost every interaction has a cognitive and behavioral component. A term like ‘psychologically informed practice’ was a way for us to allow this discussion to break free of some of the CBT realm. People are getting MAT training now. We know of different health systems providing that. All of their practitioners discuss an important component of behavior. Ten years ago that may have been seen as CBT and then only psychologists should be doing that. I think the psychologists probably are very comfortable with it. For us, the psychologically-informed practice is a nice term in that it’s a little bit soft and vague, like the biopsychosocial model. It was meant to get away from some of the issues we’ve had with spinal manipulation versus mobile. Let’s just acknowledge that this interaction is part of every patient encounter. There is a psychological component. It may be so involved at some point that you need the help of a mental health provider. We think for most routine situations, and I consider someone with pain catastrophizing in fear a routine situation, certainly PTs have the skills that we think that the patient can still benefit. Otherwise, like I said, psychologists are not dying to get in line and treat all the musculoskeletal pain that PTs want to try to turf off. It’s just listening to things that we didn’t enforce as much when you’re doing practicals in your competencies and you’re doing your clinical training. 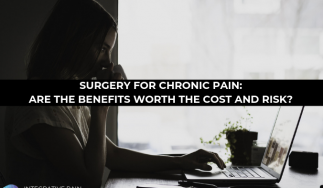 The second part would be if your goal is still to be an effective provider, and if you want to play a role in helping with this chronic pain problem, then I think you need to think of ways to have these skills to what you feel comfortable with. You brought up a good point about that personal scope. There’s nothing wrong with having a lower-level of comfort with this and knowing where your personal scope is. I don’t think everyone has to have all levels of psychological informed cares or have 30 different behavioral things they need to do and interviewing techniques. My expectation would be that there are some fairly low-level things that a PT can learn in a weekend. Even though I think conceptionally it’s a right angle, it’s not a right angle. We’re very good at talking to patients. We’re very good at listening. It’s just listening to things that we didn’t enforce as much when you’re doing practicals in your competencies and you’re doing your clinical training. I think where the frustration lies right now is our traditional continued education models and proposed professional licensing, credentialing and residency programs are still geared towards those traditional skills. It will be really interesting to see if the market starts creating some of the psychologically informed type of approaches. We have talked about it at Brooks Health in Jacksonville a few years ago. It may have even been as many as eight years ago talking a little bit about it. There’s always a question about the market. I think there are still some people who feel those traditional skills are the higher-valued ones. Unless it’s linked to some manual therapy credentialing, it may be hard to drive some of those folks. From my perspective, what’s going to be really interesting to see what emerges from that. There are certainly things you can do, there’s enough trials now with pain-coping skills that I think there are material that are publicly available for the motivated person. You can go and find that. For the person who’s waiting for the 16-hour 2-day course in Austin, Texas, that model isn’t quite there for this yet. To be honest, I’m not the person to deliver that course anyway because it takes a ton of time to do those courses right and get them so you can deliver them again as that scale issue comes up again, so we could deliver it across the country each weekend. That’s a commitment to do that and to do it well. 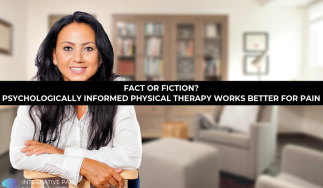 When I think of traditional physical therapist practice, they’re obviously working on manual therapy, they’re working on exercise, so things are happening that they’ve traditionally done for years to bring in the biopsychosocial model or psychologically informed therapy. We start to think about it almost like a psychologist. A psychologist, you’re sitting in a chair or you’re reclining on the couch talking about your beliefs in life. Is there a place now, as we move forward, where you may actually just talk to your patient for the entire session and give a psycho-educational intervention, and not do, let’s say, manual therapy or exercise for maybe one or two sessions interspersed throughout care? I certainly think there’s going to be models for that, especially when you talk about mental health. That to me is the most obvious. I think if they’re face to face with you, I think it’s a wasted opportunity as a PT. The main difference between psychologists and PTs is that it’s not in their scope of practice to touch a patient. I think we would be neutering ourselves a little bit if we adopted that model completely. Anecdotally, I think it’s quite powerful to have that conversation while the person is doing the task, the lifting and actually have that conversation and the PT knowing that they’re going to be talking to the person immediately before or immediately after, maybe even during, something that they’re afraid of doing, something that they think is harmful to their back, something they know is going to aggravate their pain, which as PTs traditionally we’ve avoided that. We used the clinic as a way to do soft touch. I’m not meaning literally soft touch, but I mean I don’t want to do an exercise that hurts this person because they’re going to leave my clinic flared up, they’re going to rate my satisfaction low. I think what experienced clinicians know is there is usually payoff for that. People don’t continually worsen and worsen and worsen. First of all, a good clinician knows a trajectory is going to be different anyway. Someone who is worsening, worsening, and worsening, now you have to take a step back and really dig in and see, is this one of those closer to redder flag type of issue? Those are really, really rare, that’s what the data suggests. Again, from my ancient clinical experience, when I’m honest with that, I did have the fortune to pick up on a few of those, but they were rare. They weren’t a once a week phenomenon. If I referred someone once a year back and they came back with a true medical diagnosis, that was more the norm for me. You touched on two important topics. One, the red flags that clinicians are trained to recognize and obviously those are, in essence, almost like a medical emergency where someone has an infection or a tumor. Those are really along the lines of the biomedical model. 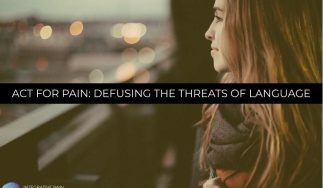 We’ve talked a lot about yellow flags, in this podcast, the beliefs, the cognitions, the emotional parts of pain. There’s a part in between there that is really, I believe, in the realm of a licensed psychologist. Maybe you can talk about that a little bit, the orange flags, and how that relates to PT practice, because we’re not talking about treating those patients, correct? Definitely not. The one we always fall back on when we teach this to PTs because I think it does help them identify, is if someone comes to you and says they’re feeling down today, “Yeah, it’s rainy.” Then they say, “I’m thinking about hurting myself or killing myself.” “Oh, really? Yeah, you are having a bad day.” “I have a plan to do it.” Everyone knows what to do with that. That is, “Let’s sit down here. I’m going to sit with you.” We know what to do with that and that’s the classic orange flag. I think there are other orange flags related to anxiety and depression where the physical therapist needs to at least talk to the patient about it and maybe talk if there was a referral source. Are they aware of this? Check the medication history. Sometimes people are aware of it but they haven’t disclosed it because of the stigma reason. Really get to the bottom of that. I definitely think what we worry about though is that’s not an elevated pain catastrophizing score. The difference between someone says, “My pain hurts all the time and it’s not going to get better,” and the person who has a suicidal ideation and a plan for it are worlds apart. I think sometimes PTs like to try to get those worlds very close because the person that says, “My pain isn’t going to get better” is not an easy person to manage. It would be nice to magically know where to send that person because I do think we want to help that person. I don’t think we’re trying to dismiss that person. I think what we learned in all these researches, maybe the PTs are a very good place for that person to be but it takes a change in mindset and a little bit more patience and an understanding that it’s not a physiological phenomenon. We’re not going to find that magic lever in their spine that if we push, that pain is gone, and all of a sudden that person says, “You cured it. It’s so much better. You pushed on that magic button and now it’s gone.” It’s a more complex situation. It has to do with their beliefs, their behavior, probably how they experienced pain in the past and how it’s been modulated. There are a lot of different things. I think it’s really exciting clinically. When you and I trained, it was all about where you rotated right, left, up, down. If you were an honest practitioner, you notice I pushed the wrong way sometimes and someone got better, I pushed the right way sometimes and they doubled in pain. There wasn’t a linkage there, at least not satisfying enough for me. Sometimes just talking to the patient actually makes them better in some ways, in many ways. In professional term we’d call it a broken leg in some ways looms over our profession. That’s our insurance reimbursement system and for PTs specifically are coding. When I think of how important it is, this biopsychosocial model and the psychologically informed practice, it’s so important that clinicians start to integrate this. When I think of our coding system, it’s supposed to be really easy because our coding system really is in line with our biomedical model in many ways. Will this start to disrupt, so to speak, our CBT codes and diagnosis that we use in physical therapy? What we have learned, we’ve learned this mainly from some of the therapists, is they do use some of the patient education coding. This comes up when we go around and we do this. Right now we’ve done most of the training for a large trial. The University of Pittsburgh is the primary site, it’s called the Target Trial. It’s basically looking at PT and primary care and quick referral for psychologically informed practice. Because it’s a pragmatic trial, there are questions about the billing. What we have learned, we’ve learned this mainly from some of the therapists, is they do use some of the patient education coding. If you’re doing this while the person is doing therapeutic exercise or therapeutic activities, it can be justifiably billed. I think there are some ways around it that you can incorporate these along with the traditional PT thing, which is really what we’re pushing, psychologically informed practice is a very integrated approach. If you look at the 2011 article that Chris and I presented this in the special issue, it was really about integration and the power of that integration, so it makes sense. We’ve always been talking to people while we’re doing that in coding. We’re just talking about you’re actually being strategic and therapeutic now with the discussion, and maybe that discussion is based on their beliefs instead of what the basketball score was last night or football, or what the weather is. I think there are some ways around it. The other thing though that is encouraging is there are some systems that are going more towards bundle payment. The individual billing is less important because now you’re going to get a set amount of resources to manage a set amount of patients and we’re going to track the outcomes. It encourages efficiencies, not necessarily billing. Some of the systems we’re in, that evolution had already started to occur. Obviously, this is at a higher level than you or I. I think some of these solutions are going to emerge. We always say in the course, as long as you’re not violating your scope of practice and ethics, be creative a little bit and look for opportunities. I would love to have the day when PTs can bill directly for this. I think because of the way the coding and the reimbursement is, that’s going to take a bigger shift in the landscape or in the terrain. As practices and things, as long as you’re fully disclosing what that part of your cash payment is, is to incorporate behavioral principles that are within the scope of my practice, I would disclose that just in case you had someone come back, a disgruntled person and said, “They were doing this, they never told me and they charged me for it too.” That’s another way to take care of it. I have to say, the psychologically informed practice really does help support, one, direct access and then two, primary care physical therapy. On episode 49, I spoke with Dr. Bill Boissonnault from the APTA and we talked a lot about those two topics. I think this really fits in perfectly and then really gives us a lot of support as a profession. If you want to be a primary provider for pain, if you’re not at least screening for psychological, you’re not a primary provider for pain in this day, that’s as direct as you can say it. That’s not me saying it because I think I have a portion in the race, that’s what the evidence suggests. The UK, they do a lot of their primary care decisions on back pain based on the STarT Back Tool and it is very psychosocially oriented. A lot of care decisions are made after that, so I agree completely. I want to thank Dr. Steven George for being on the podcast. Dr. George, can you tell everyone where they can find out more information about you? I’m at Duke University. My middle name is Zachary. It’s very good to put the ‘Z’ in there because there are a lot of Steven Georges but there are less Steven Z. Georges. If you do the DCRI and Duke MSK Research, the MSK is for musculoskeletal research. Actually we are pretty much at the top of those when we’ve done some practice searches. If you do any combination of those, you’ll probably land on my Duke webpage, which has our team here at Duke and links to some of the papers and presentations, and we do try to keep that up to date because we’re a newer group. I’m the starting my second year this week. We thank Dr. George for being on the podcast. To all the listeners, make sure that you share the information with your friends and family. For this one especially, if you’re a physical therapist, it’s a really great topic to inform all of your colleagues about psychologically informed physical therapy. Thanks so much. I’ll see you next week. Thanks, Joe. Thanks a lot. Dr. George’s primary interest is research involving biopsychosocial models for the prevention and treatment of chronic musculoskeletal pain disorders. His long term goals are to 1) improve accuracy for predicting who is going to develop chronic pain; and 2) identify non-pharmacological treatment options that limit the development of chronic pain conditions. Dr. George is an active member of the American Physical Therapy Association, American Pain Society, and International Association for the Study of Pain often attending annual conferences and serving on committees. Dr. George’s research projects have been supported by the National Institutes of Health, Department of Defense, Brooks Rehabilitation, Orthopaedic Section of the American Physical Therapy Association, University of Florida, and Foundation for Physical Therapy. Dr. George and his collaborators have authored over 185 peer-reviewed publications in leading physical therapy, rehabilitation, and pain research journals. He currently serves as a Contributing Editor for Physical Therapy and an International Editorial Review Board Member for Journal of Orthopaedic & Sports Physical Therapy. Dr. George is also a member of the Advisory Council for the National Center for Complimentary and Integrative Health. Dr. George is a past recipient of the J. Brooks Brown Research Award and has been recognized with prestigious research awards from the American Physical Therapy Association, American Pain Society and International Association for the Study of Pain. In 2016 Dr. George was recognized by the Florida Physical Therapy Association with the Scholarly Impact on Practice Award. This award acknowledges dedicated scholarly activity that has made a meaningful difference to clinical practice by physical therapists in Florida. Also in 2016 the American Physical Therapy Association recognized Dr. George as the Jules M. Rothstein Golden Pen Award for Scientific writing in recognition of his contributions to Physical Therapy and as the 21st John H.P. Maley Lecturer for making significant contribution to the profession in clinical practice.